Mountain Views from the Hot Tub! In a setting like this, you'll hate to go inside. 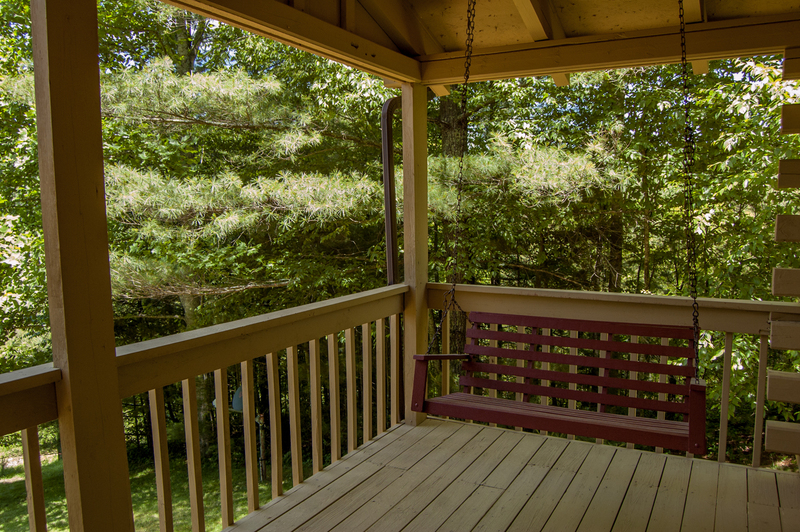 Grill and entertain on the large deck, enjoying the mountain views and rolling hills from your rocking chair or porch swing. 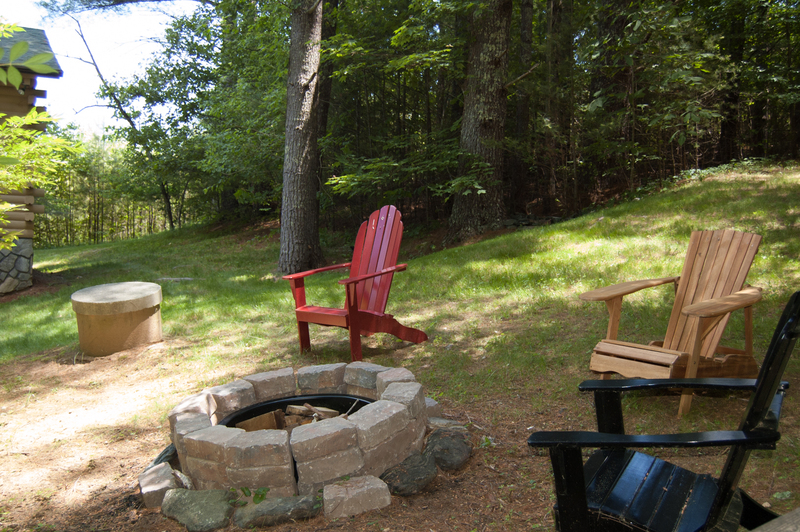 Then close out the evening with a campfire in the fire-pit. Or soak in your luxurious, private hot tub - also with a gorgeous mountain view! This is relaxation at its best, with stunning scenery and open spaces all around - and no other homes crowding in on your serenity. 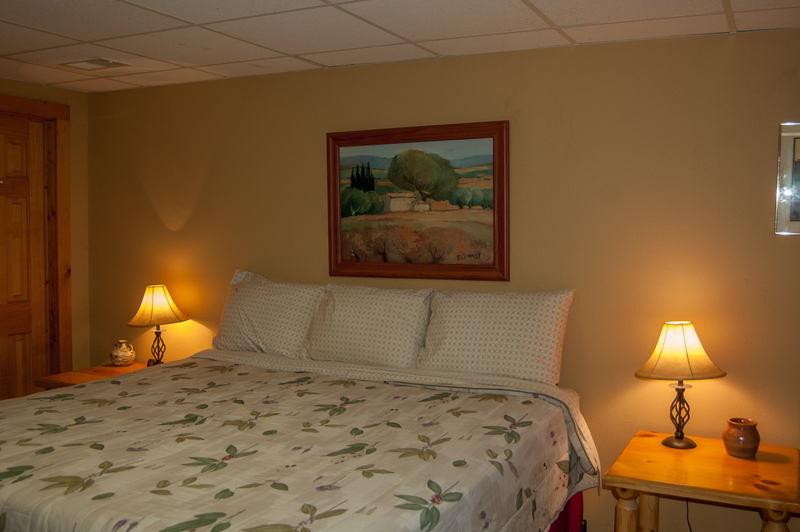 The comfort and relaxation continues inside your Riverbend Retreat. 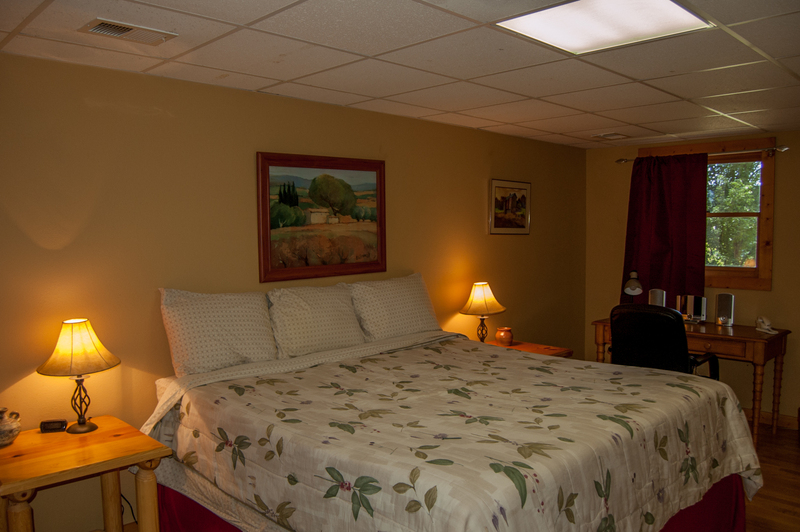 The master suite on the lower level offers a king bed and en suite bath. This level also features a private media room with satellite TV as well as sleeper sofa. 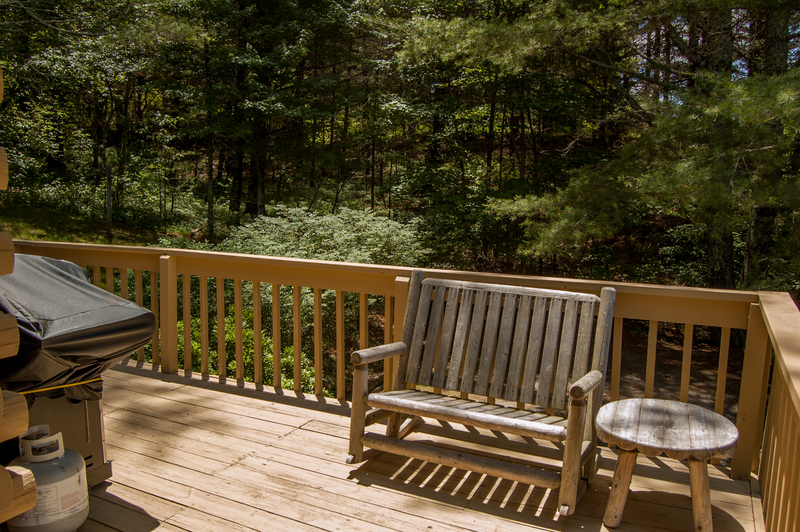 From here you can access the lower deck and hot tub. 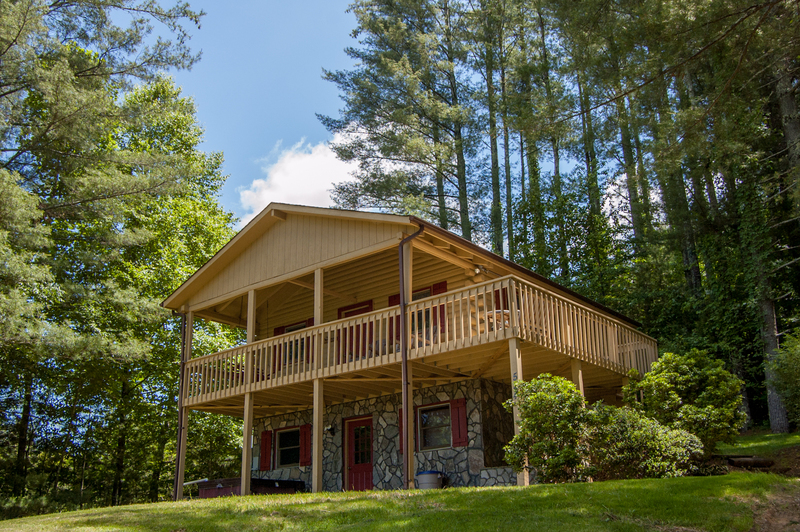 This retreat sleeps 8 total, with the addition of two more bedrooms on the upper level, each with a queen bed and a full bathroom to share, with a tub/shower combination. This upper level features a family room with rustic charm, comfy furnishings, a gas-burning fireplace and scenic views from every angle. The kitchen is beautifully equipped with microwave, dishwasher, coffeemaker, blender, crock pot, and all the dining accessories you might need. 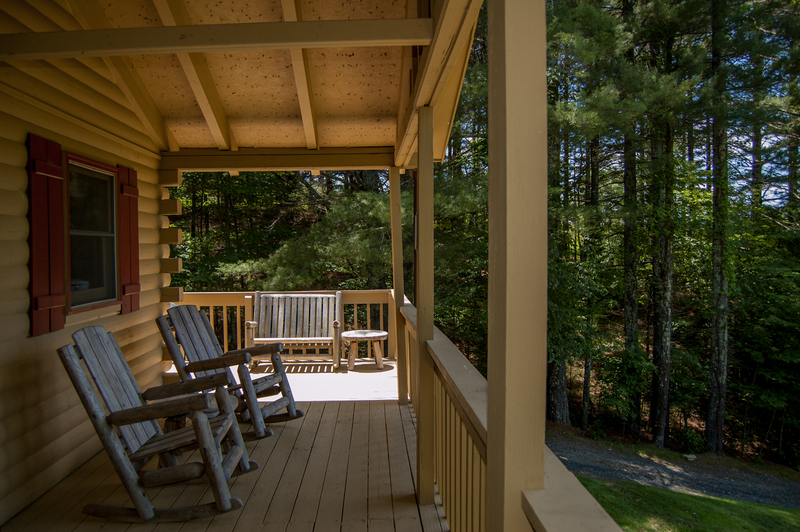 The kitchen conveniently opens to the covered porch for outdoor grilling and dining. 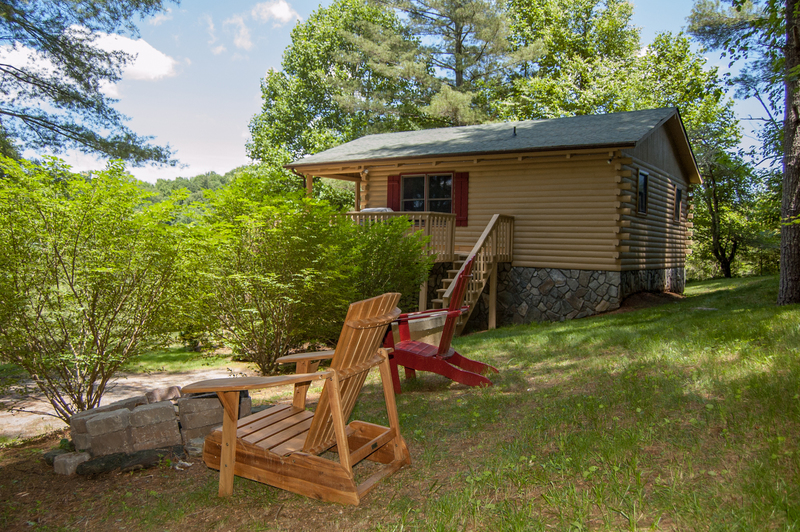 Let the cool mountain breeze gently rock your worries away while vacationing in this totally private log home. 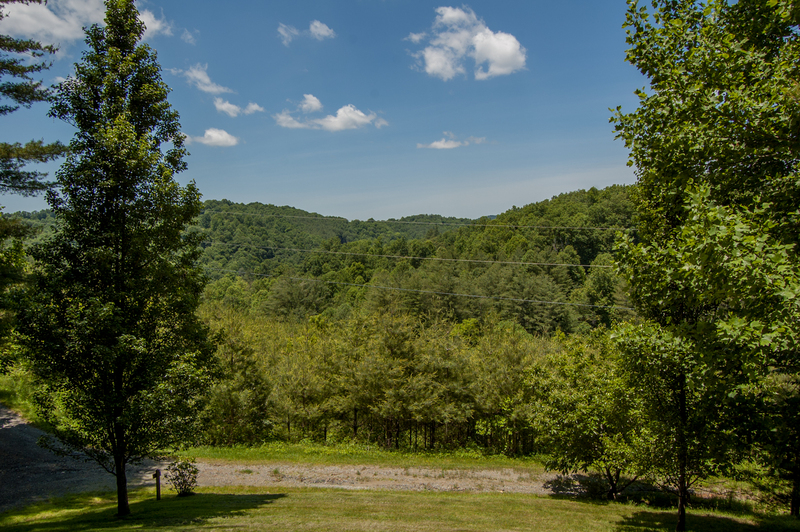 Delight in the vistas, lush green scenery and family-friendly activities nearby. You've picked the right spot for an unforgettable mountain vacation! 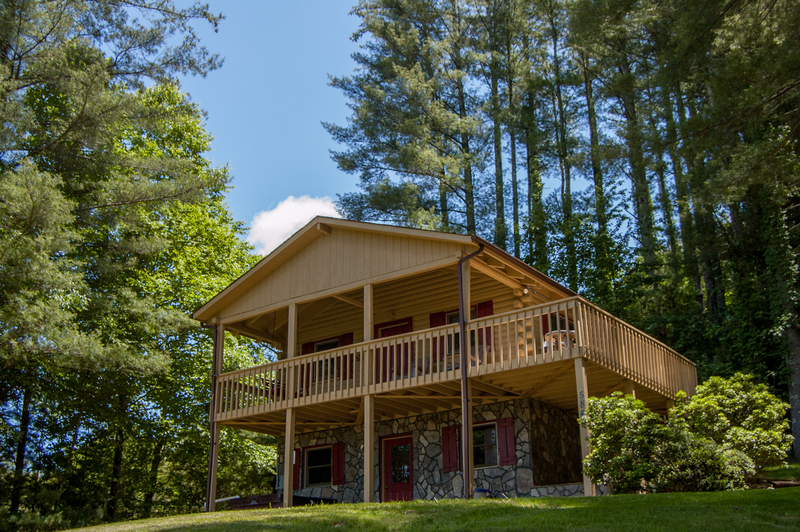 Riverbend Retreat is in the northern part of Ashe County, very near the New River State Park, where you can enjoy all the mountains have to offer - canoeing, tubing, kayaking, fishing, hiking, picnicking, and all the fresh air you can breathe. You're also close to the Virginia Creeper - North Carolina and Virginia's premier mountain biking trail, which stretches 34 miles from Abingdon, down thru the lovely town of Damascus, along the Whitetop Laurel River and up to its highest point at Whitetop Station, near the NC state line. The Virginia Creeper Trail is open year round to hiking, mountain biking and horseback riding. Don't miss this ride - a blast for the whole family, with several bike rental shops to serve you. In the High Country, gorgeous scenery awaits you at every turn. In the nearby mountain town of West Jefferson you have restaurants and terrific shopping, including antique stores and art galleries. There's even a movie theater. This is small-town Americana at its finest. Drive a little further to Boone or Blowing Rock, for an even wider assortment of dining, entertainment and shopping options. Tour the campus of Appalachian State University, or visit our craft breweries. And don't forget to take a drive along the Blue Ridge Parkway, for some of the country's most awe-inspiring views. You'll understand how our mountains got their name! If you're dreaming of a snowy mountain winter, you've also come to the right place. Enjoy sledding, snowboarding, skating - and of course skiing - all winter long. 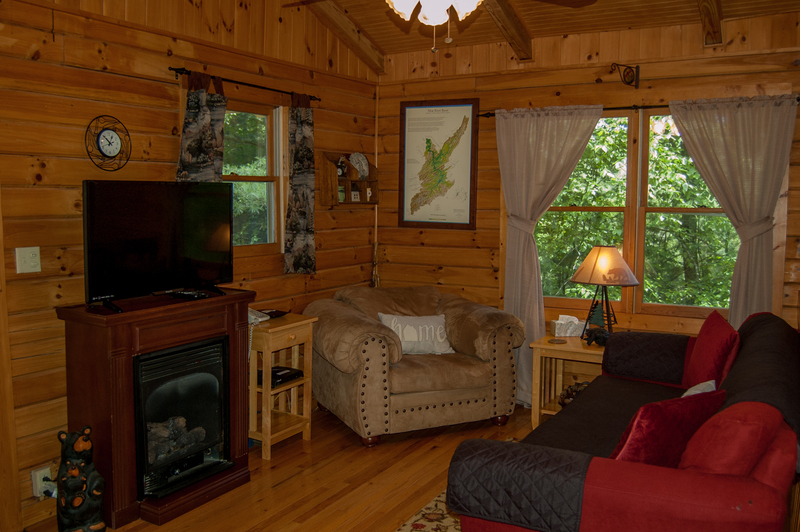 Or watch the snow fall softly and serenely outside, while you're cozy in the cabin! No matter when you visit, this peaceful Retreat will help you melt the stress of the city away! "Cabin was very nice, comfortable beds and very friendly staff"
"Nice cozy cabin, well maintained with great views"
"Very nice cabin. Everything was clean and comfortable. I enjoyed my morning coffee on the porch watching the squirrels play in the trees and evenings in the hot tub. The 3rd step on the outside does need some attention as it is not level and made trips up and down a little difficult. Also would have been nice to had a non slip mat in the showers because they are very slick. Other than that everything was great. " 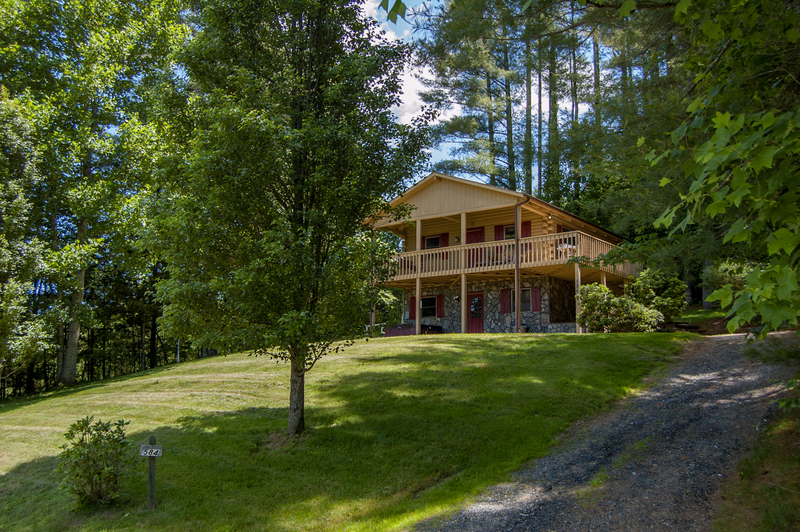 "We were looking for a rental in the northern part of mountains that was a little remote! And we found it!" 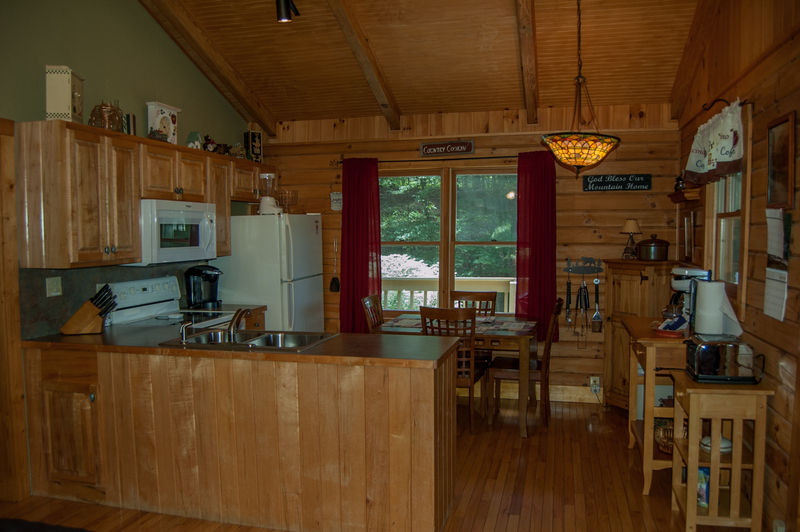 "The cabin was clean and nice for the most part. The kitchen does lack some supplies. Their was no television in the upstairs den area; only downstairs. The WiFi is not good but that could have just been the mountains. " "The view is the best part of this cabin. It's nestled into a beautiful area at the end of a dirt path. The path is quiet and not much traffic. The cabin is quaint. The bedrooms are a good size but both living rooms and the kitchen are very small. The TV is located downstairs which isn't a huge deal. We wanted to watch a movie but the space was too cramped and had 1 couch. The most dissatisfing part are all the house rules and extra fees. You can only leave 2 loads of laundry. Anything beyond that is a fee, the washer there is tiny. It wouldn't wash more than 5 towels at a time. If you use all 3 beds and each person uses 1 towel then that accounts for 4 loads of laundry which means you pay a fee or your stuck doing laundry before you leave. That was disappointing." "Nicely appointed home base for exploring the area. Very comfortable. " "The first week was active with the grand children. The second week was restful without them. The house was in a perfect location to access town but not hear traffic at night. It worked great for 7 people." 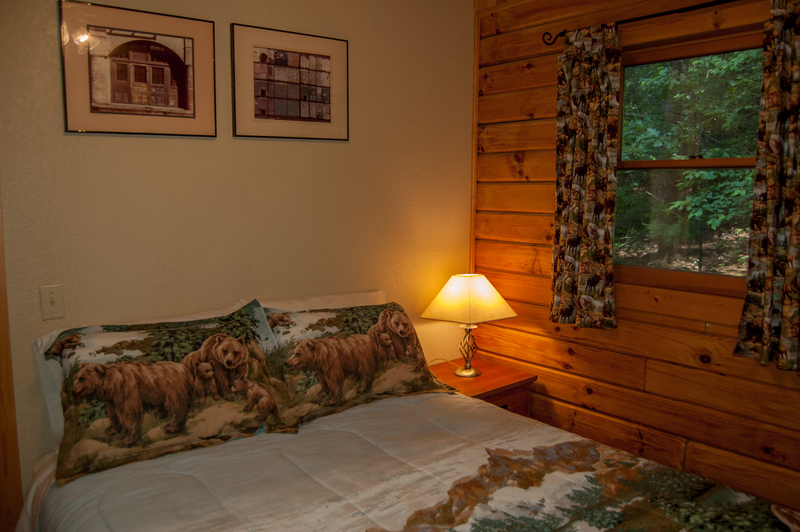 "Our family was very comfortable in this cabin. It had all the amenities you would need for a stay in the mountains. We were 7 in total plus a dog. The description on the site is accurate; the cabin is very private. Our three teenagers loved exploring the wooded area around the property during the day. At night they would hang out on the porch and howl because they could hear the animals respond from the woods. One of the members of our family is terrified of heights and the drive to the cabin for her was not pleasant. On our first night she said she would not leave the cabin for the entire week, but she found the courage and we were able to enjoy all the great activities North Carolina has to offer. I will say the roads take some getting used to as it is a one lane road up the mountain to the cabin. (Note: there were rarely any other cars on the road). I recommend arriving during the day so that you get the lay of the land. During our stay we had a small issue with one of the locks, we called and within an hour or two someone had come to fix it. One thing I would say is the plumbing can be a bit of a hassle; we tried not to flush paper down as to avoid any issues. Overall, we had a great experience! "Our family had such a happy thanksgiving together in the Riverbend Retreat. All seven of us were able to sleep comfortably ( although we would definitely recommend a new mattress for the pullout sofa) while enjoying days filled with long walks, good food and games. The view was spectacular! " "My family and I absolutely loved our weekend in this beautiful cabin. It was a great time of peace and solitude. " "LOVELY HOME WITH ALL THE AMENITIES. ANY CONCERNS WE EXPERIENCED WHEN WE ARRIVED WERE QUICKLY MET AND TAKEN CARE OF. JUDY AND JERRITA FROM THE REALTY CO. WERE JUST THE GREATEST! BEAUTIFUL VIEW, GREAT HOT TUB, BREEZY AND COOL. HATED TO RETURN TO OUR HOME ON THE NC COAST!! WELCOME 99 DEGREES. AND LOTS OF TOURIST. THANKS ASHE HIGH COUNTRY FOR A RESTFUL AND FUN 3 WEEKS. " 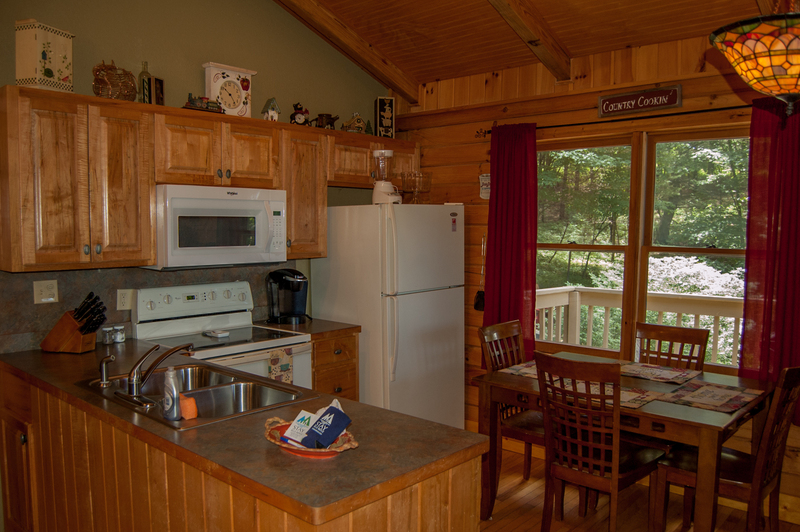 "The cabin was perfect for our family vacation. It was clean and cozy in a picturesque location. Very nicely decorated. The hot tub cover is very old and should probably be replaced; the ends are torn and the clips are broken...not a big deal as it was still functional. The location is a bit hard to get to, which is great for privacy..I recommend traveling to there in daylight. " "Overall, we loved the place! Very secluded and quiet. Two things I would like to mention: Google Maps does a great job of getting you there but doesn't tell you to turn left onto the road that the cabin is actually on. It'd be nice if you would include that extra step into the email instructions. The second thing is the hot water heater wasn't turned on and we didn't realize it until late on our 2nd night so we took cold showers the whole time we stayed. 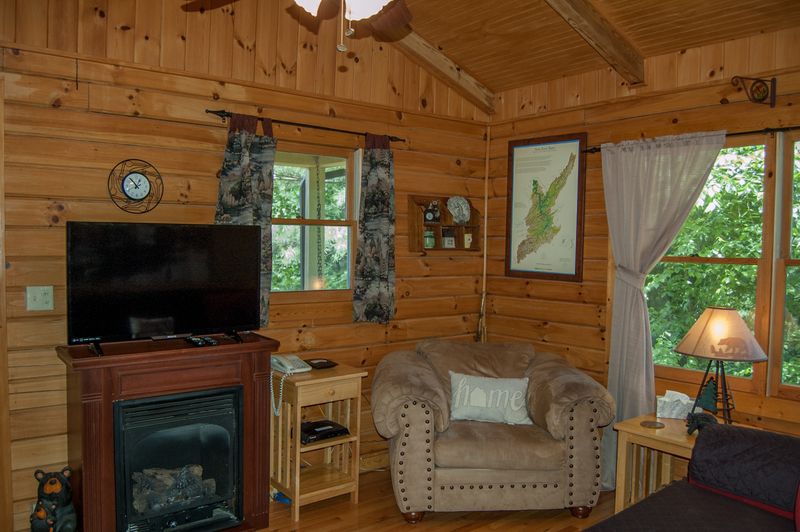 Like I said, the cabin was exactly what the picture and description portrayed. " "Had a great weekend in this quite cabin. Absolutely will rent again.would recommend to anyone. Love the hot tub." "We really enjoyed our weekend in Crumpler. The Healing Springs on the way to the cabin were really neat, and the cabin itself had everything we needed. The house was clean and well appointed. We had a little trouble getting the fireplace to light but the staff was very helpful, and though we nearly got snowed in the staff extended our checkout time to allow us safe departure. We'd happily stay here again. " 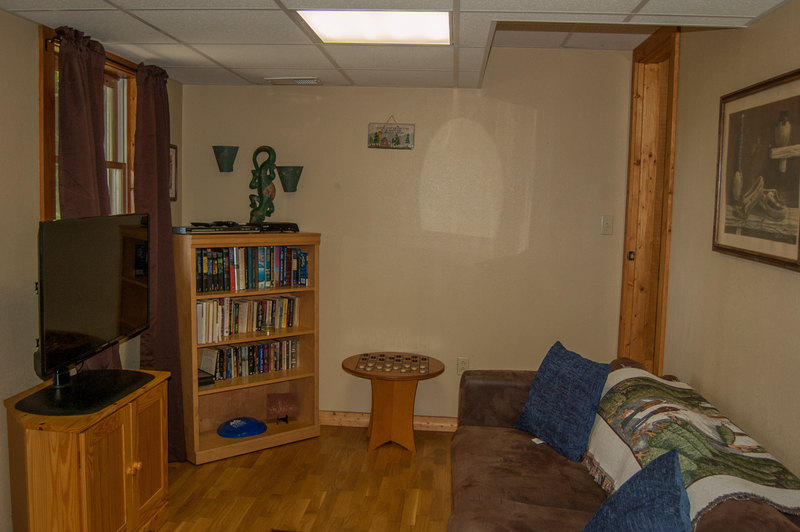 "Loved the privacy and the hot tub, well stocked and appreciated owners just replaced the old TV with a new Flat Screen. We will be back!" "I truly loved this place. The management company is very attentive if you need something, or if you need to report damage in the cabin. The place looks pretty in the pics but it's actually beautiful in person. Cleaned, just a little outdated. Very peaceful and I would definitely go again! My whole family loved it. " "Cozy cabin, welcoming. Quiet and secluded. Love the personal touches. Only downside is a 20 year old tv that barely works. Only 1 on lower level. No tv in living room on top floor. No cable. Satellite dish but service wasn't activated. Wifi works to stream on your device. A front door that doesn't block view would be a good idea as well. " "We had a few glitches with our stay but overall it was a wonderful holiday. We had a lovely day out on the river and that evening our AC went out and with all the sunburn and heat exhaustion that was not much fun to be without for the night as it was very warm and muggy, then we had an afternoon where showers were being taken and the water just cut off and we had to search out a breaker to restart the water. Things like this give your holiday a bit of character and give you something funny to chuckle about." 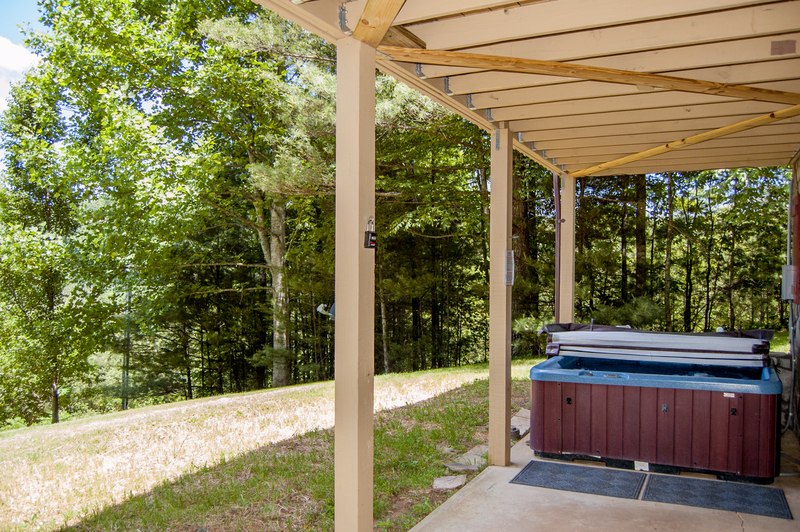 "During booking and time on location the property management was very professional and responsive.The location was great for privacy and proximity to canoeing and tubing.Also it was very close to Shatley Springs restaurant and only 20 minutes from Jefferson. The views from the deck at sunset kept me on the deck in the evening. The hot tub was a great way to end the day. The WiFI was ample to support video streaming which saved our evening entertainment since the TV was an old 90,s model and the Satellite only offered 5 channels. Also the gas grill on the deck worked but needs replacing since the handle and dial was broke. Still we had an enjoyable week and if nature and relaxation are your goal this is a great vacation place. " "Overall this rental was as described. Very out of the way, private, and peaceful. The road in could use a little work and there were a few cleaning issues that we had to take care of, but other than that we were very pleased. This is the place to go if you want to get away from it all. We will definitely stay again! I imagine the fall is gorgeous from here!" 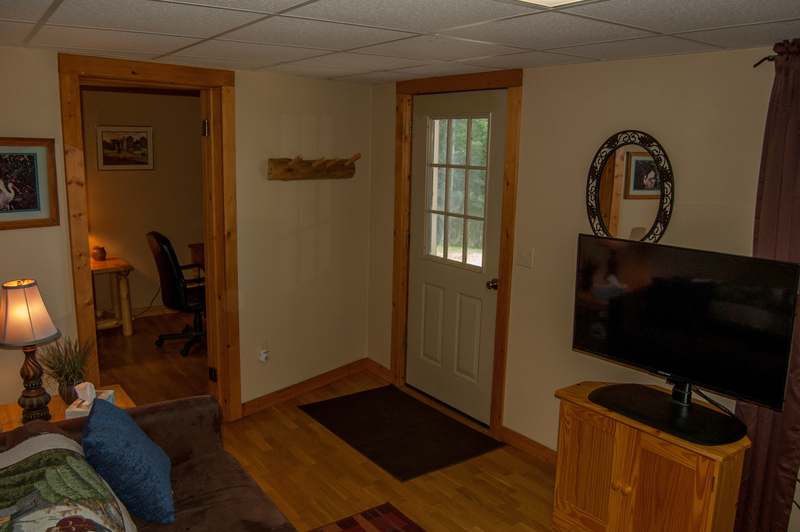 "The cabin was very nice, clean and simple. The Tv halfway worked and was very small but spent most of the down time there in the hot tub which was awesome. " 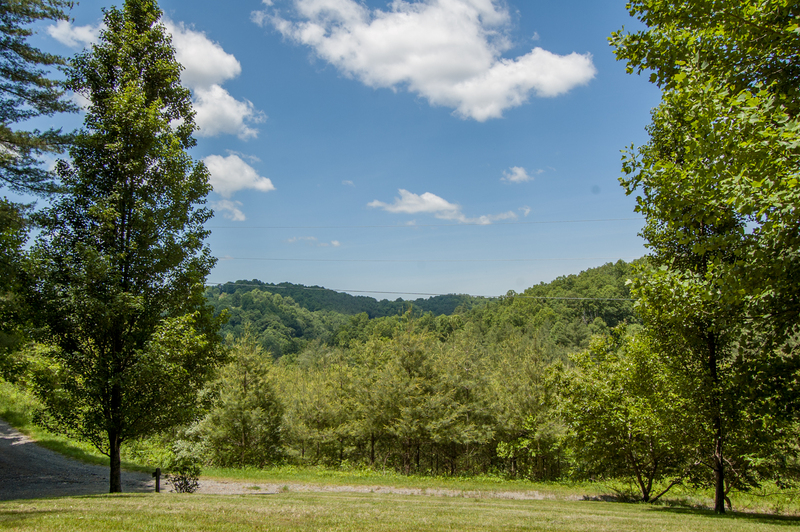 Property is very private and you're only 20 minutes from downtown West Jefferson for dinning, shopping and more! TV is being upgraded. "The place is beautiful, we had a good time with the family. Was excited to hear bear sounds nearby." "It was great, I was in peace and will return again." "Google maps had a sharp left turn on 16 just past Wilkesboro that didn't exist but I found the house anyway. Great house, I'll definitely go back. " "We stayed over the weekend and had a nice time. The cabin was a bit smaller than we anticipated. " 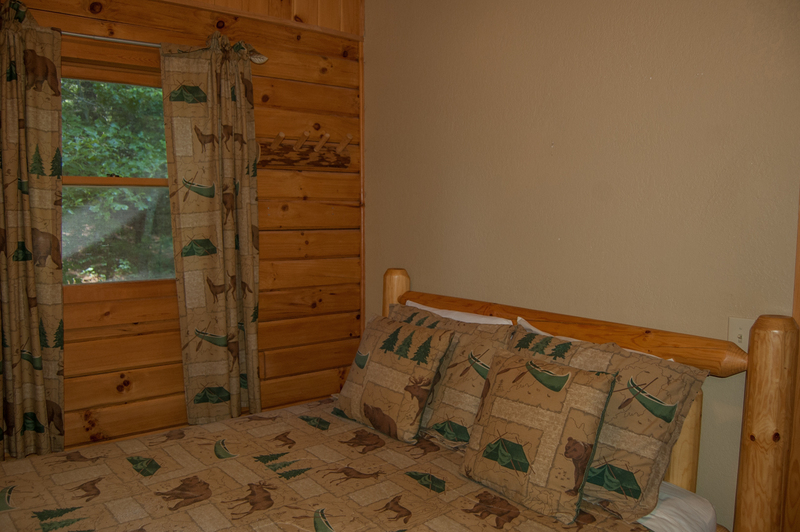 "The cabin was clean and comfortable for our group. We had a very nice, relaxing visit to the mountains. There was a problem with carpenter ants and one of the beds was not useable because of the "sawdust" sprinkling down from the wooden ceiling." "Our trip was great and the cabin was amazing! It was perfectly nestled in the mountains and boasted breathtaking views of the beautiful scenery. Jerrita was so helpful and was really a pleasure to work with. " "Our anniversary and Thanksgiving get-away was just great. With daughter and granddaughter we really enjoyed the cute and cozy cabin. The owner had provided everything we needed. Riverbend Retreat was a perfect location for all the activites we planned in the area-especially near Shatley Springs (Yum, yum). Jerrita was most helpful in booking our vacation." "This place was amazing! With plenty of room inside to spread out,everyone had their own space. Outside the yard was very big and well kept. The hot tub was a wonderful place to relax and watch the Perseids meteor shower. The mountain veiw was also amazing,especially in the early morning having coffee on the upper deck, and late evening as the sun set over the ridge. We also enjoyed the 4hr. float trip on the New River. We had a wonderful time at Riverbend Retreat and are thinking of making it an annual destination. Thanks for a great vacation, and we hope to return soon." "Only issue was the refrigerator went out on Saturday and we were forced to leave Sunday morning vs Monday morning. Still waiting to hear back from agent about refunding Sunday night. Other than that, the stay was great. Very quiet and relaxing." Refrigerator has been repaired and refund given for the inconvenience. "This place was great, our teenage girls loved it! " "It was a great time with 3 couples. We had a blast! We would absolutely stay there again." "it was a wonderful time my family and i loved staying there.the only problem was after the snow fell it was a little tricky getting down the driveway but the view before and after the snow was perfect thank you for a great stay "
"My wife and I, along with two other couples, stay at Riverbend Retreat for the weekend. This house was absolutely fabulous. The entire house was well stocked with everything you could possibly need. Wonderful!! We will be coming back soon, the weekend went by way too fast." "My wife and I had a blast at the Riverbend Retreat. Everything was prepared for our arrival and we were within ten minutes of Shatley Springs. The seclusion was much needed and the view was great. We were able to completely relax for two days. We WILL be back. " "We enjoyed it - the cabin is well stocked. 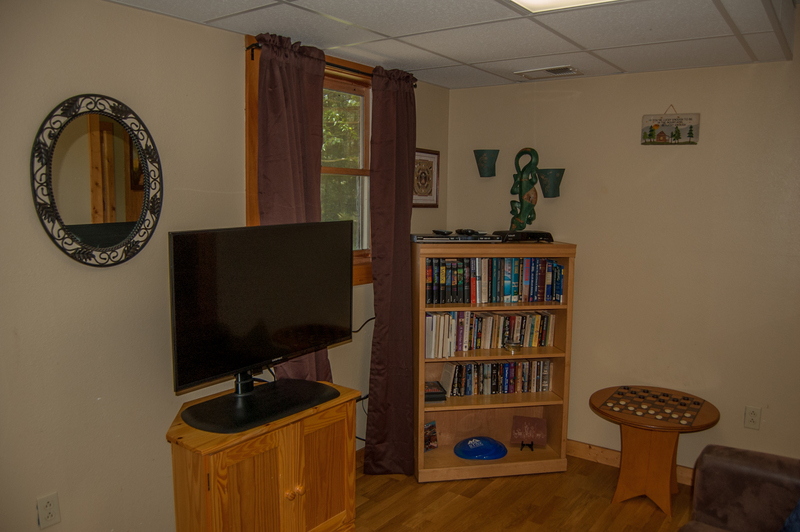 It would be nice to have one more tv either in the bedroom or upstairs, but it was also nice to have some piece and quiet... "
"My friends and I had a great time staying at this house on our girls' weekend. The house was clean and comfortable and the view was beautiful. The weather wasn't great, so it was nice that we were so comfortable in the house!" family and we are already thinking about our next trip, hopefully in the summer of 2012!!!" "My family and I were very pleased with our stay at the Riverbend Retreat. The Cabin was great and the location was great as well. We are looking forward to another stay with Ash County Realty." "There was no extra toilet paper. Other than that everything was outstanding!" We provide the initial supply of paper products to get you started but if you are staying for several days with a big group plan ahead or grab some extra at the store. There's a great general store right down the road only 5 minutes away. "Really nice place & great location. However we had two issues that kept me from rating the stay a "5 Star". Issue #1: We were given the wrong security code to get into the lock box. There was no AT&T cell coverage in the area so we had to drive 20 miles to get the correct lock box code. #2 there was only one roll of toilet paper per bathroom. Our family of six used them up & we had to go buy our own, also the light light in the master bathroom did not work & we had to replace it. Over all we were very pleased with the rental. Hopefully these comments will help the rental agency make this a "5 Star" property in the future." "A great starting point for rides in N. Carolina, Tennessee, and Virginia. Try state routes old 16,88, 194 and of course the Blue Ridge NC. Routes 421 and 67 in western TN, and route 58 across SW VA as well as the Pkwy and Pipers Gap Rd. (620) to Mt. Airy and 678 and 691 back to the Pkwy. at Orchard Gap." "We enjoyed the hot tub!" "We were there for our Honeymoon, it was very nice and the house was very beautiful. We expectually liked the Dog, that we named Rosco, (a hound dog of some sort). He is a neighbors dog, very friendly and will leave shortly after he get's you all settled in.Very sweet! We took a canoe ride down the New River(we suggest a 2 hr ride)we took the 4 hr ride and it was very long but nice. The view from the house on the porch was lovely if we could do it again it would be a must. very private, no one around, you are the only house on the street. we had a wonderful time and thanks for it being so enjoyable. "